Get relief from dry eye with help from eye care specialist in the San Diego area. Learn more below and contact a trusted eye care provider to find the right treatment for dry eye. Find an office near you in the San Diego area. 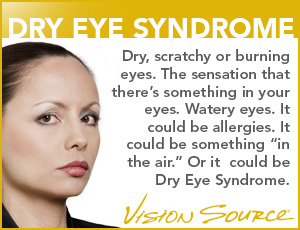 Dry eye is a very common medical condition that can sometimes be difficult to treat. While over the counter tear drops may help in mild cases, moderate to severe cases often need advanced or custom solutions, such as LipiFlow, a proven solution for long-term relief. The first step is diagnosis through a comprehensive eye exam that will evaluate tear production and eye health. There are many advanced medical procedures that include closing tear ducts to reduce tear loss or, in the case of LipiFlow, unplugging clogged tear ducts to improve flow. Optometrists can even prescribe special contact lenses that compensate for lost moisture. Treatments to unblock oil glands with medical devices or even warm compresses may also bring relief.